For over 30 years we have concentrated on extending service life and on protecting components. Increasing the operational availability of your hydraulic and lubrication systems, as well as reducing downtimes, is still our main focus. With our innovative products, HYDAC can also set the standards in the Process Technology sector. 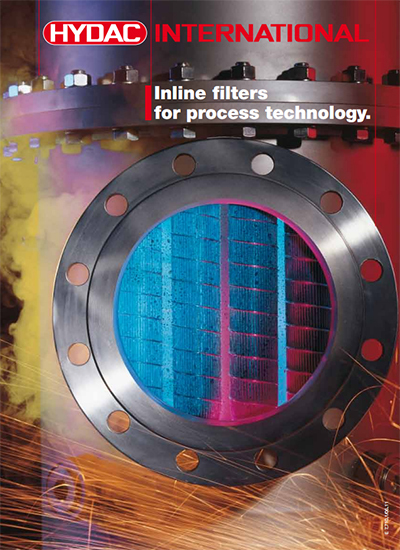 We supply back-flushing filters and inline filters for many applications in Process Technology. 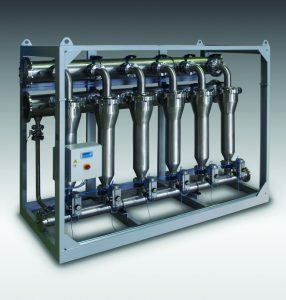 Special advantage: in addition to high-quality individual components, such as filters, clogging indicators and breather filters, we can also supply sophisticated filtration systems and clever tank solutions. The HYDAC AutoFilt® TwistFlow Strainer ATF is suitable for the intermittent filtration of solid particles from water or fluids similar to water. Since only a portion of the flow is used to clean the filter, filtration can continue virtually unaffected. The filter is of course particularly suitable for offline applications which can operate for a short time with a slightly reduced flow. The fluid enters the housing tangentially. As a result of the tangential flow and the tapered housing cross-section, the fluid flows down spirally. The centrifugal forces created to separate the high-density particles (e.g. sand, glass, metal particles, …) to the edge of the housing. These are then deposited in the lower part of the housing and can be cleaned out periodically. The remaining low-density particles which are not deposited at the bottom of the housing by the centrifugal force are separated by the conical slotted tube which has a defined filtration rating. 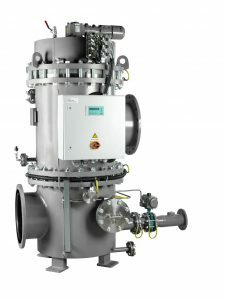 With filtration ratings of between 200 and 3,000 µm, the AutoFilt® TwistFlow Strainer ATF is particularly suited to the separation of solid particles in suspension up to several grammes per litre from preferably water-based or low-viscosity fluids. As a manufacturer of automatic back-flushing filter series AutoFilt®, our products have demonstrated their reliable performance in nearly all industrial areas thousands of times. With the new, patented technology of the HYDAC AutoFilt® RF10, we break new ground and offer a solution for applications where conventional back-flushing filters reach their limits. Back-flushing independent of the pressure on the filter clean side.